according to a Native American myth, four hunters killed the Great Bear in heaven. It was autumn then. The bear's blood splashed over the forests drenching the leaves red. When the hunters cooked its meat, the fat dripped, colouring the leaves yellow. Hence every year as autumn approaches, the leaves prepare to change colour from green to a fiery red to a dazzling yellow. While this folklore makes for a bedtime story, science has another explanation. Production of pigments, just like any other function of the plant, comes at an energy cost. The increased presence of pigments like carotenoids and anthocyanin direct the change. But why invest in leaves that are about to fall? The red colour is a warning to the insects to stay away from the tree, says the theory of coevolution.Marco Archetti from the department of zoology, University of Oxford, UK, studied apple trees to provide some proof. Apple trees bloom in autumn. At other times, the tree has enough nutrients to fortify itself. But after fruiting when it is about to shed its leaves--the food producers--the tree needs to show that it is still capable of warding off attack. Hence the colour change and it works. 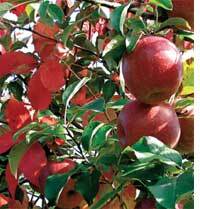 Archetti examined two trees each from 2,170 apple varieties and observed their association with aphids. The red-leaved trees attracted fewer aphids than green varieties. The ones that developed on red-leaved trees had a survival rate of 29 per cent as compared to those on green trees (61 per cent). While 62 per cent of the wild varieties in central Asia were found to change their colour to red in autumn, only 2.8 per cent of the cultivated varieties turned red. Trees under cultivation are artificially selected for high productivity. This selection overrides many traits including their mode of defence. Hence the trees do not change colour. The study was reported in the April 15 issue of the Proceedings of the Royal Society B.